ANIMAL WELFARE GROUPS are claiming that reports compiled by the National Parks and Wildlife Service (NPWS) reveal evidence of terror and suffering inflicted on hares during coursing events. The reports are prepared on a yearly basis and are the result of monitoring by wildlife rangers at coursing events around the country. The rangers attend to ensure that the conditions of coursing licences are being adhered to. The Campaign for the Abolition of Cruel Sports (CACS) says that there are references in the reports to hares being struck and mauled, as well as being pinned and dying from their injuries. The reports were obtained by the Irish Council Against Blood Sports (ICABS) via a Freedom of Information application. Aideen Yourell of the ICABS told TheJournal.ie that data is obtained each year in the aftermath of the coursing season in order to expose the practice and to make lists of “the kills”. Yourell said that nothing contained in the reports illustrates illegal activity, but that the OCABS and other groups are anxious to highlight the “inherent cruelty” that goes along with hare coursing. Even if there are no injuries no hare should be chased by two dogs up a field. The government’s draft Animal Welfare Bill exempts hare coursing from new laws forbidding cruelty to animals “unless the hare is hunted or coursed in a space from which it does not have a reasonable chance of escape”. In March the Minister for Agriculture, Food and the Marine Simon Coveney said that the government had no plans to ban hare coursing, and that the “situation is kept under constant review to ensure that coursing is run in a well controlled and responsible manner in the interest of animal welfare for both the hares and greyhounds alike”. Minister of State at the Department of Agriculture Shane McEntee said in February that coursing was a vital part of the greyhound industry in Ireland. The Irish Times reported that McEntee said there was no danger to the hare and that people should come and witness the events for themselves. Dáil Technical Group TDs Maureen O’Sullivan and Clare Daly have said they intend to introduce a private members Bill calling for the abolition of hare coursing. Yourell claims that politicians that support coursing are “terrified to lose a handful of votes”. She said that while she and her counterparts know they are called a “bunch of cranks”, that they feel they have succeeded in “giving coursing a bad name”. 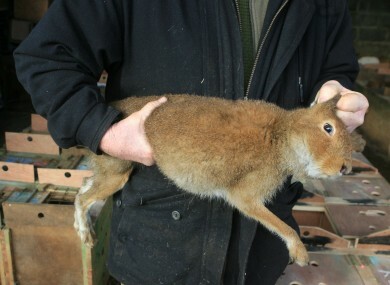 Email “Calls for an end to "inherently cruel" hare coursing ”. Feedback on “Calls for an end to "inherently cruel" hare coursing ”.